Scotiabank offers a variety of credit cards that cater to different needs. If you’re someone who wants to earn cash back every time they use their credit card, then the Scotia Momentum VISA Infinite card could earn you $500 in your first year of use. I’ve used it for years and it’s still my credit card of choice. Let’s look at the details and see if this credit card is the right fit for you. Sign up today to start earning Scotia Momentum VISA Infinite rewards! 10% cashback ON ALL PURCHASES for your first 3 months up to $200! 10% cashback is unheard of in the credit card world, and while it only applies to the first $2000 you spend over the first 3 months, that’s an easy $200 cash back right away. 4% cashback on all eligible grocery and gas purchases! If you spend a lot of your monthly budget on groceries, or you drive a vehicle that isn’t easy on gas, this 4% can add up quickly. 2% cashback on all eligible drug store and recurring bill payments! Monthly bills can easily add up, and if they are recurring bills that get charged to your credit card, the additional 2% savings can start to build up. 1% cashback ON ALL OTHER PURCHASES! 1% may not seem like a lot, but if you put all small and big purchases on your credit card, over the year, that 1% back can turn into a few hundred dollars. $99 annual fee waived first year! While the Scotia Momentum VISA Infinite card does carry a $99 annual fee, Scotia will waive it for the first year. Sign up now to get your bonus 10% cashback on all purchases, and the first year $99 fee waive. Since I spend roughly $2,000 a month on my credit card, the above table counts the 10% cashback for the first month, and then the regular cashback amounts for the next 11 months. Therefore, monthly cashback X 11. I live with my partner, and I put all grocery store purchases on my card for the both of us. We are somewhat frugal on what we spend on groceries, and spend about $300 for both of us. 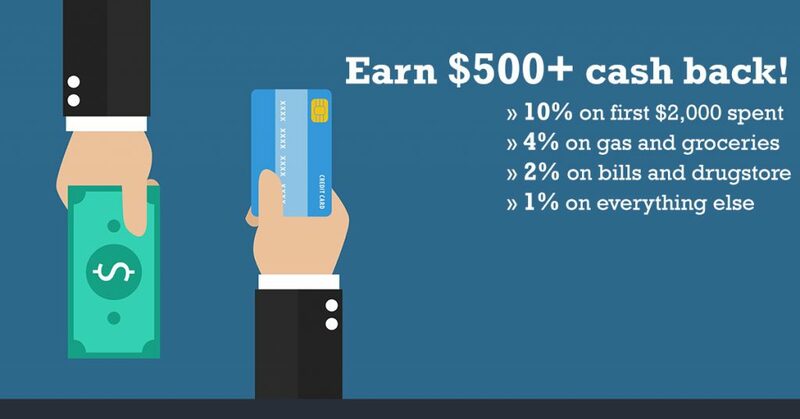 If you eat more meals home than I do, or you are buying groceries for a larger family, you can really increase your cash back by using this card. I drive a Mazda 3 a short-ish distance to work everyday, as well as making longer trips back to my hometown to visit my family fairly often. Between this, I spend about $130 per month on gas for my car. If you don’t own a car, this card may not be for you, as the 4% cash back on gas is a major perk. If you have a long commute to work and back, or have a larger vehicle that is harder on gas, then you may be able to make even more cash back with this card! The monthly bills can add up, especially if you are on expensive mobile phone plans, or are paying for family cell phone plans. The monthly bills that I get 2% cash back on include my Netflix subscription, my monthly internet bill, and my cell phone bill. It also covers things like a $14 monthly Patreon subscription that I have for some podcasts that I like to support, as well as an Google Ad money I might spend, for anyone who works in the website world. This is my lowest cashback category, as I don’t spend a lot of money at the pharmacy. This category does cover purchases made at big stores like Shoppers Drug Mart, so if you do a lot of shopping there, it can really payoff on the cash back. For me, I make various purchases as drug stores over the year, and spend an average of about $10 a month. As the category claims, everything else covers all of your purchases that aren’t included in the bonus 4% and 2% cashback categories. This is my major spending category as I spend an average of $1,200 on everything outside of the main categories. This can be especially lucrative if you are making some big purchases, like appliances, or if you can put major down payments (like a new car) on your card. The only way to have any credit card work for you and earn you money or bonuses is by PAYING IT OFF IN FULL EVERY MONTH! The minute you fall behind, and start having to pay interest payments, the card stops being worth it. I put every purchase on my credit card, big and small, and pay off the full balance at the end of every payment period. I essentially use it as a debit card. If I don’t have the money in my bank account to pay off the card, then I won’t make the purchase. $500 is what you can earn in the first year of use with this credit card, but the cash back will drop starting your second year, because you won’t get the 10% cashback, and you’ll start to be charged the $99 annual fee. Even in my second year, I still earned $300 cashback after paying the annual fee, all just for using this credit card for every purchase! If you can find another credit card that provides more than $300 cashback after your first year with Scotia Momentum VISA Infinite Card, you can always cancel your card , before your first charge of the annual $99 fee. People often get scared of using credit cards, as they hear stories of people racking up thousands of dollars in debt and being charged soaring interest fees. But if you are smart, only spend what you have, and pay off your full balance every month, you can make your credit card work for you, and earn money every time you spend! It’s worked great for me, and when I get my annual cashback payout, it feels like free money! Sign up for your Scotia Momentum VISA Infinite card now and get the $99 annual fee waived and earn a bonus 10% cash back on your first $2,000 of purchases!